Given how late we were up the night before, we were up fairly early. I took the dogs for a short walk around the neighbourhood but even at that hour, the humidity was starting to make itself felt. I quickly had the car packed up and we left our Airbnb, still without having met our host. We stopped at Way Station Coffee Co. on the way out of Savannah. 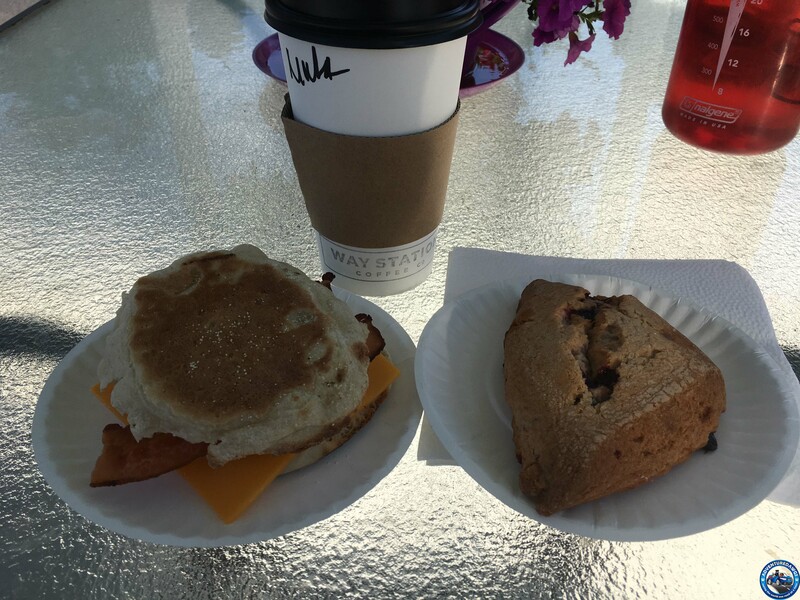 It’s a really neat set-up with lots of space inside and a gazebo where I was able to sit with the dogs and enjoy a mocha, breakfast sandwich (bacon, eggs and cheese on an english muffin), and a raspberry-white chocolate scone. The only downside is that the gazebo does not have any good scenery since it’s right next to the parking lot and a busy road but if that’s the worst thing about it, well that’s pretty good overall. 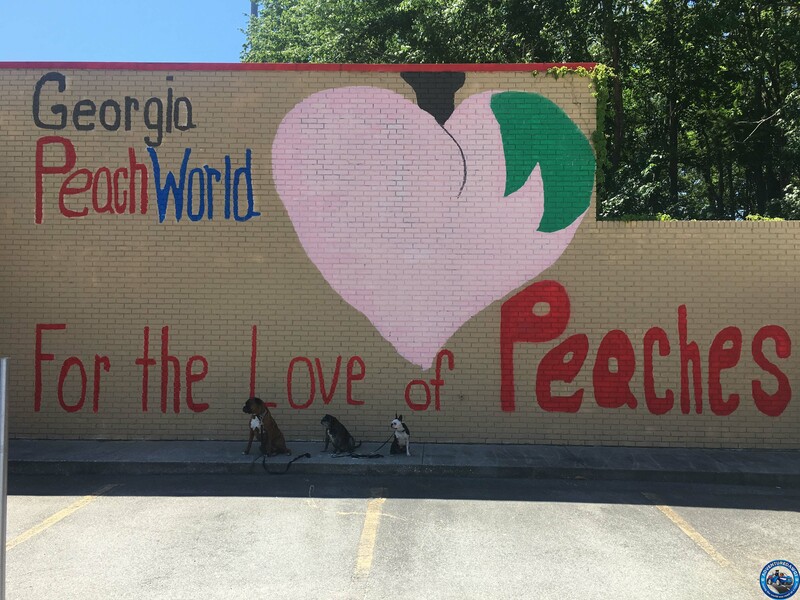 We weren’t on the highway long before we saw signs for Georgia Peach World. Well of course I had to stop and investigate. There was a stand out front with plenty of fresh produce, with almost half of the stand holding baskets of peaches. I went inside and was promptly handed a sample of a peach slushie. I told the gentleman he was my new best friend as I finished the small cup in one swift gulp. They had shelves and shelves of products for sale and everything could be sampled. After a short course of sampling and nibbling and questioning them about the bestsellers, I left with a jar of peach salsa, praline pecan honey butter, and peach cider. And the man behind the counter explained how he will take some of the cider, add a bit of vodka or gin, and pour it into a freezer bag to get to slushie consistency. I felt my eyes go wide. Yes! I had never thought of using a freezer bag but that is brilliant. 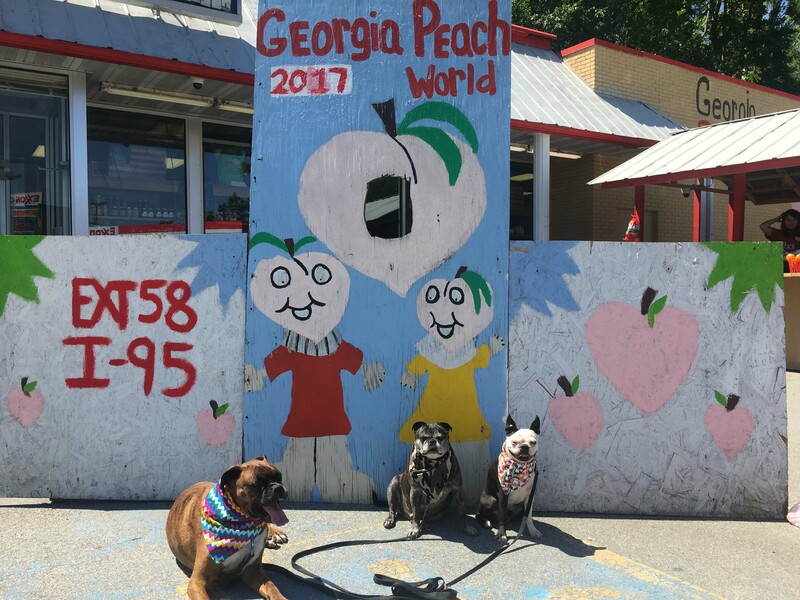 I then stopped at the stand outside and bought a quart of peaches and ate almost half a dozen as I sat with the dogs outside while they had a drink and some photos before climbing back in the car. We were driving down the highway when I saw a sign for a beach. I wanted to give the dogs a chance to swim since it was getting really hot so I guided us into historic St. Mary’s and stopped at the visitors centre. Well the woman working there told me there was no beach close by and that I would want to avoid letting the dogs swim anywhere nearby anyway because of alligators. I had thought that the beach would be on the ocean so no concern for gators but evidently I was wrong. But she did tell me that there was plenty of dog-friendly patios nearby and oh there is a dog park. Yay dog park. Turns out the park was very close to the welcome centre and I was able to find it even though there were no signs and it’s at the end of an unnamed dirt road. 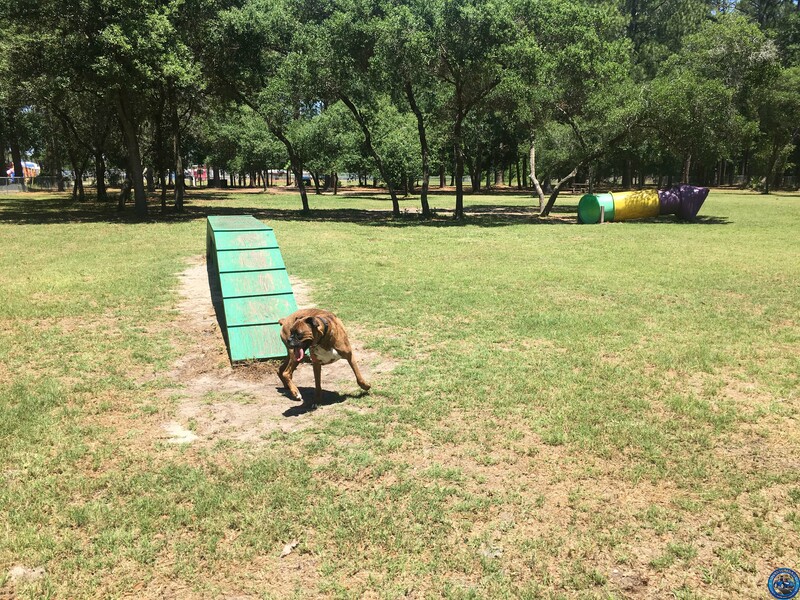 The dog park was fenced with a smaller section on one side and an absolutely huge main section. The smaller part was completely treed and very shady while the main section had trees in half. 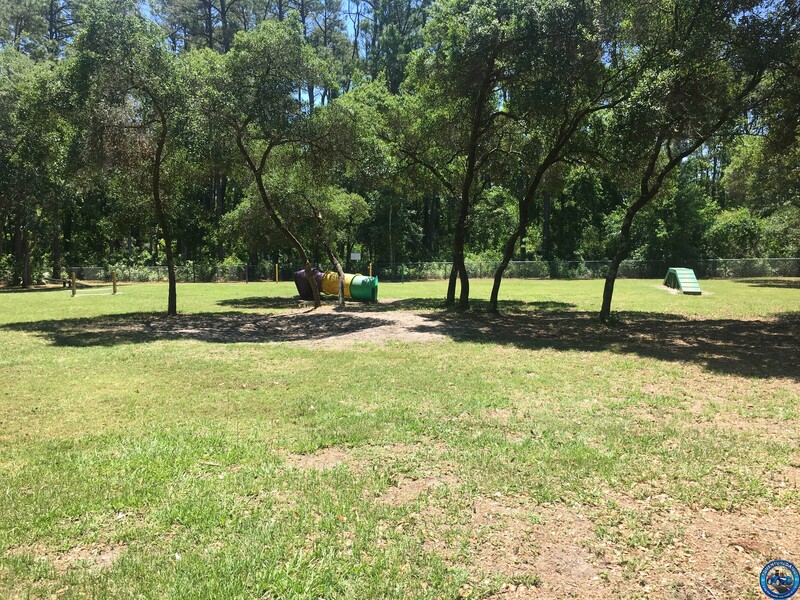 The rest of it was open to the sun and had some agility equipment for the dogs to play on. Piper tackled the elevated walk with no problem. Leo needed a bit of coaxing to get on the walk but once he figured it out, he seemed to wonder what the big deal was. Jack just looked at me with that “You’re kidding, right?” expression. After one lap in the heat, the dogs stopped running around and found shady places to sit; or in Leo’s case, a place to roll. I tried to get them interested in playing but gave up after the second lap. 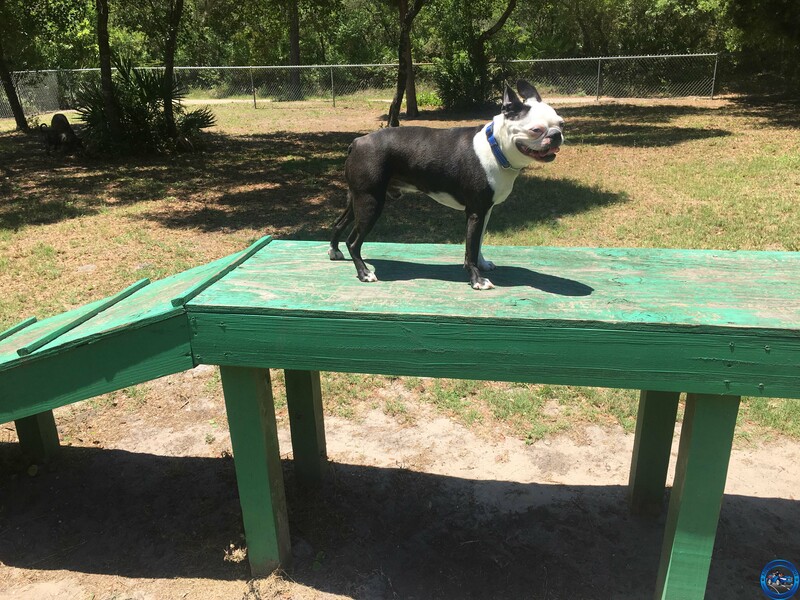 My only complaint about this park (and it’s a minor complaint) was that there was only one place for the dogs to drink and it had a thick rubber bowl. It was made of the same rubber as those heavy black rubber horse buckets that tend to get a funky stink. But since the dogs didn’t want any water out of their own bowl they couldn’t have been too thirsty. And back on the road. Pfft no problems here. You can just see the fence at the parking lot in the back. But not for long as we soon crossed into Florida and just had to get a photo to commemorate the occasion. Not long after it was time to start looking for a place to eat. 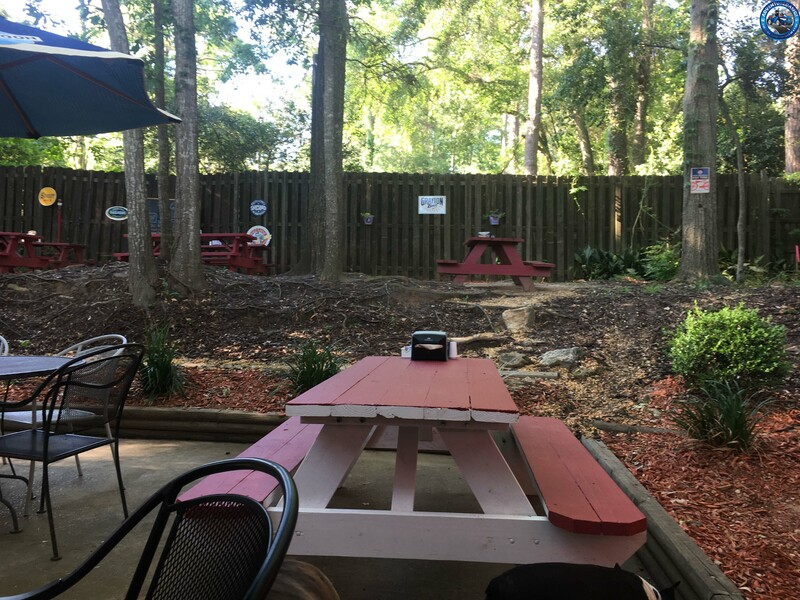 A quick consult with Bringfido.com sent me to Wells Brothers Bar and Grill in Tallahassee. Sure enough, dogs are allowed on the patio in the back and I quickly retrieved my darlings and we got ourselves settled. Our server brought out a big bowl of water for the dogs and gave them some loving as I faced off with an impressive menu complete with a selection of craft beers. There were several items on the menu that I thought were intriguing (The Lip Smacker burger with peanut butter and jelly…) but I decided on The Ad Burger with a side of sweet potato fries. Hands down, this is one of the best specialty burgers I have ever eaten. Ever. Why specialty? For starters, it’s served on toasted sourdough and topped with a fried egg, pepper jack cheese, black bean mix, and cajun mayo. Even the sweet potato fries were outstanding: crispy with salt, sugar, and cinnamon. It says something when the dogs don’t get any samples. Yes that’s right. I ate it all. Part of the back patio. 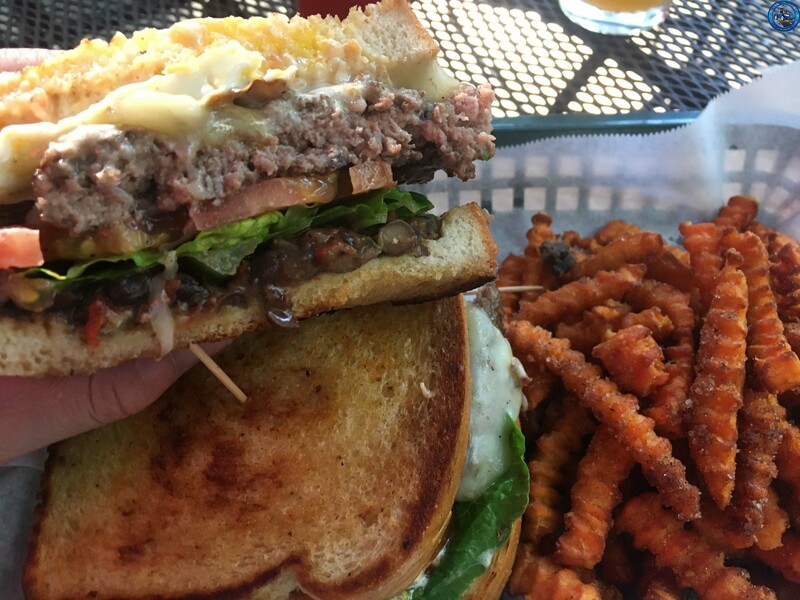 The Ad Burger with sweet potato fries. YUM. Pleasantly stuffed, we headed back out and started to look for a place to spend the night. We went to check one campground but all of the sites were taken. No problem, I saw there were primitive sites so went that way. The only problem with that plan was that you have to register with the office before going to the primitive sites. And no one was in the office. Crud. OK there was another campground further down the road. And by the time I got there, the gates were closed. Florida parks close at sundown. Who knew? I was driving towards Pensacola hoping to find either a private campground or a hotel that wouldn’t cost a kidney to stay at when I suddenly started getting the sleepies. I guess a belly full of meat and dark highways can have that effect on me. I pulled off into the next rest stop intending to put my head back for a few minutes before continuing. I walked the dogs around the lot and offered them their dinner and water which they promptly ignored. I tipped my seat back and soon had Leo on my lap, Jack in the passenger seat with his blanket, and Piper stretched out in the back seat. Even though they were sleeping the entire time the car was moving, they were soon snoring around me. I pulled one of the blankets up over me and closed my eyes.